May 4 2008, I biked up to campus with my camera. Waited and watched for several test blasts of the historic steam whistle called Big Ole. Built in the 1890s, it served on Bellingham's waterfront at 2 different mills. Then moved to Port Alberni, BC. in the 1940s. Modified in Port Alberni as it was so loud it broke windows. In 1997, Big Ole came back to Bellingham as a historic artifact. A year or so ago, it was tested at the Encogen Power Plant on Bellingham's waterfront. Still works, but has a strange moan after it's modification. 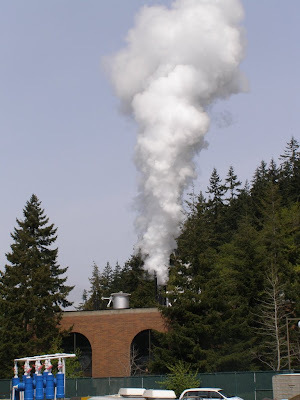 Recently installed on the steam heating plant at Western Washington University. They plan to use Big Ole as part of a campus emergency warning system. I read that it's not as loud as they would like it to be. A few people came out of nearby buildings wondering what the sound was. One person thought it might be a line break at the boilers. This is definitely a unique sound. I wonder if emergency warning sirens would work better if they had a standardized sound? Is there a protocol for emergency sounds, like the standardized number of 911? On the other hand, maybe a unique sound gets more attention? Is it better used for ceremony? Announcing a big festival on campus? At least festivals are pleasant events rather than than emergencies. Of course there are things like fire drills, where one can experience the sound without having to have an emergency. It's usually hoped that an emergency will never happen. My camera didn't pick up the sound very well. Video 20 seconds.